I think that these candle holders could make adorable salt and pepper 'shakers'. Or I could find a cheap wooden pair at the Salvation Army and dip them myself. Every play kitchen needs a little art - this postcard by Leah Duncan or this print by Tuesday Mourning would be great options. I am completely smitten with this cloud cutting board from Snug Studio. It's probably a little large and unwieldy for a little one, but luckily I have a handy husband who could probably DIY a suitable look-a-like. Leah Duncan also makes these gorgeous kitchen towels (which I may have to steal for myself), and they would go perfectly with this child's apron from Anthropologie. I also love Anthropologie's Calico Owl Knobs for the cabinet. Storage is a must for any kitchen. 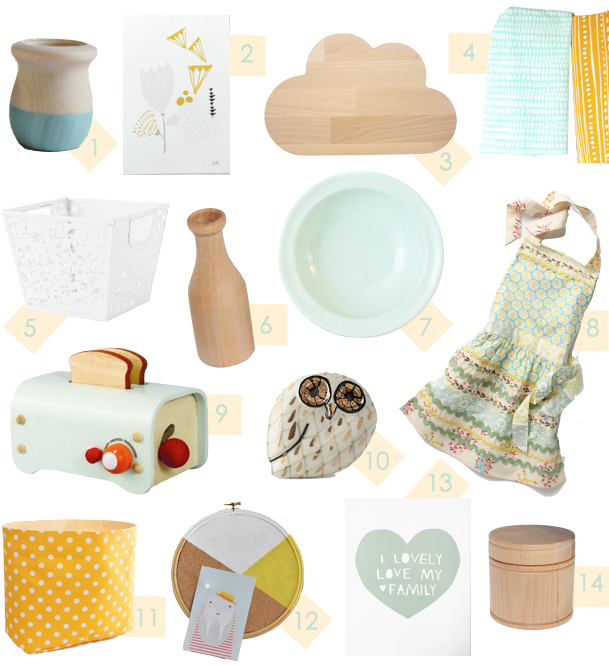 I love these wooden canisters, this cheerful yellow polka dot fabric bin, and Land of Nod's The Vines Have It containers. As far as dish ware, melamine is a must for little hands. This mint dish set would be perfection. I could definitely see myself decorating these wooden pieces with a little paint. And speaking of paint, this DIY cork board by Handmade Charlotte looks fun and easy. And last but not least, every little kitchen needs its own toaster. This one by Plan Toys definitely takes the cake. Does your little one have a play kitchen? What are your favorite accessories? We have an Ikea kitchen with the microwave top. It has room for loads of accessories - and it is stocked! We have cookie cutters, rolling pins, a wooden tray of petits fours, tea pot and cups, espresso cups and saucers, and needle felted woolen play food I make for my online shop. Don't forget the spatulas and pots and pans! We get the most use out of the play kitchen, even 4 yrs later..